The Big Torii from Matsubara Itsukushima, Aki, c. 1910. Big Torii at Miyajima, Inland Sea, c. 1910, at high tide. “The apparition thanked [Taira no] Kiyomori for the repair of ‘our pagoda’ and urged him to attend next to ‘our shrine’ of Itsukushima in Japan’s Inland Sea. 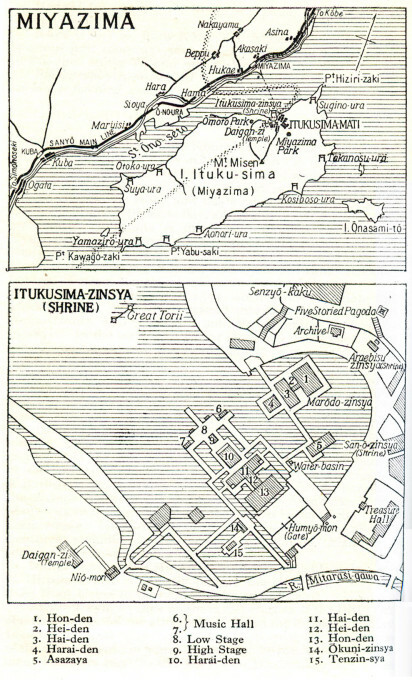 The Itsukushima Shrine, the apparition explained, was another place where the Great Sun Buddha manifested himself. If you rebuild the ruined shrine you ‘shall rise to high office. None will be able to keep abreast of you in your rise to glory.’ With this promise the apparition vanished, leaving behind only the fragrance of incense. 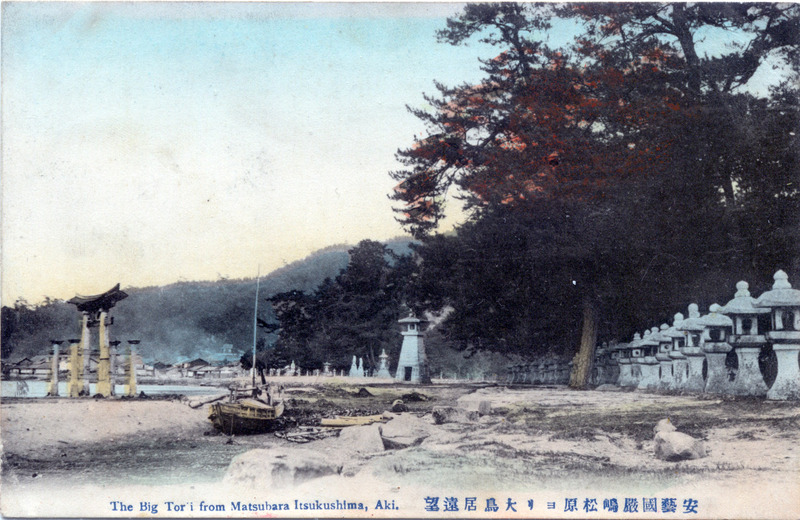 The Big Torii at low tide, from Matsubara Itsukushima, Aki, c. 1910. From the wiki: “Itsukushima Shrine is a Shinto shrine on the island of Itsukushima (popularly known as Miyajima), best known for its ‘floating’ torii gate. 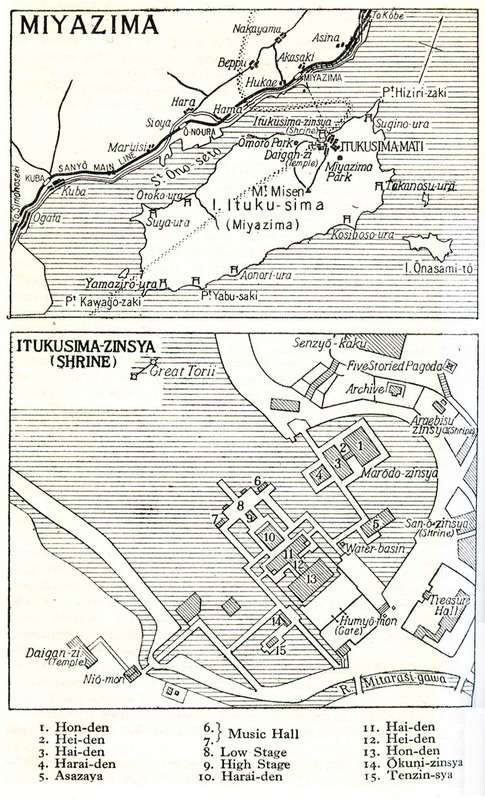 The shrine has been destroyed many times, but the first shrine buildings were probably erected in the 6th century. The present shrine dates from the mid-16th century, and is believed to follow an earlier design from the 12th century. That design was established in 1168, when funds were provided by the warlord Taira no Kiyomori. The shrine was designed and built on pier-like structures over the bay so that it would appear to be floating on the water, separate from the sacred island, which could be approached at low-tide by the devout. “The dramatic gate, or torii, of Itsukushima Shrine is one of Japan’s most popular tourist attractions, and the most recognizable and celebrated feature of the Itsukushima shrine, and the view of the gate in front of the island’s Mount Misen is classified as one of the ‘Three Views of Japan’ (along with the sand bar Amanohashidate, and Matsushima Bay). Although a gate has been in place since 1168, the current gate dates back only to 1875. 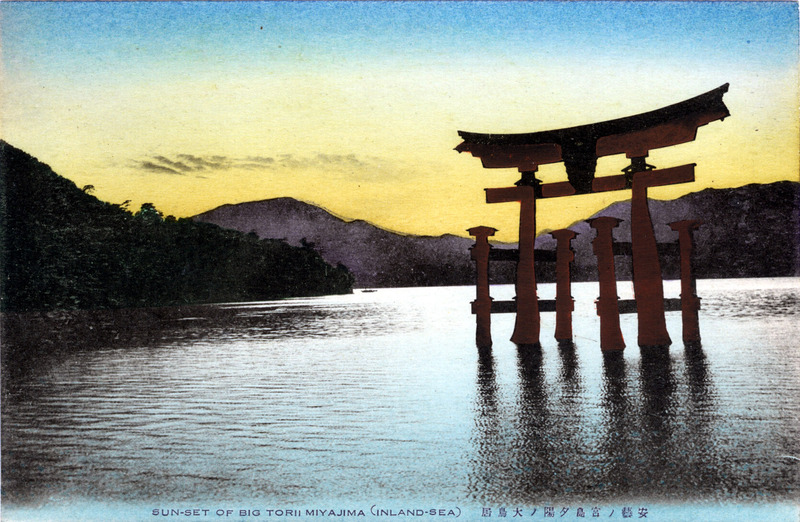 “Sun-set of Big Torii,” Miyajima, c. 1920. 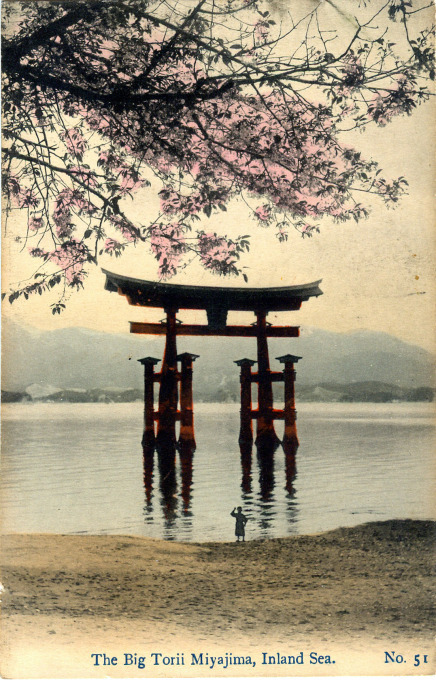 “The torii appears to be floating only at high tide. When the tide is low, it is approachable by foot from the island. Gathering shellfish near the gate is also popular at low tide. Many locals add the shellfish they gather to their miso soup. 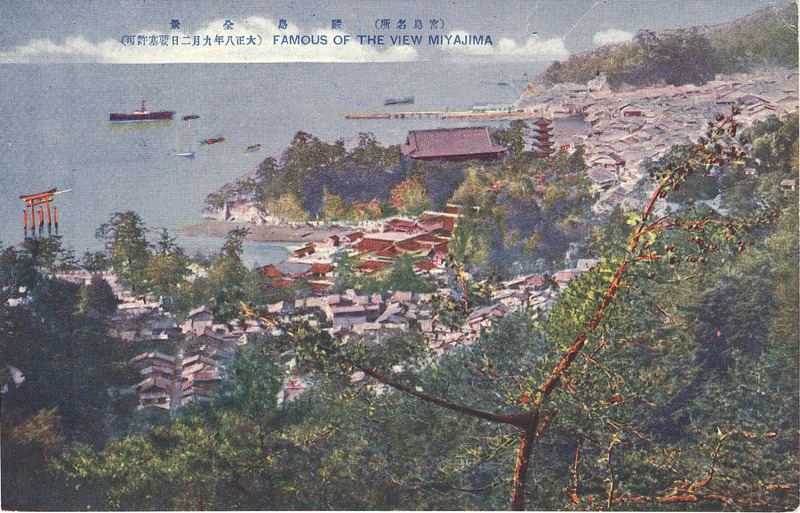 “Famous view of Miyajima”, c. 1920, showing the Big Torii located at far-left.